We’re now into the third month of the 2016 Kansas City roller derby season, and I think it’s safe to say we haven’t been disappointed. 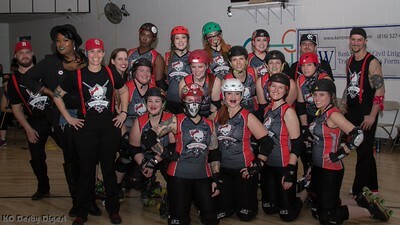 All three of the main leagues that we cover — KCRW, Fountain City, and the Blacksnake Rollergirls — have proven to be very exciting, competitive, well-matched leagues this season, and it’s safe to say roller derby fans in this town are certainly getting their money’s worth. April promises to be every bit as exciting, so here’s the schedule, and we hope to see everyone there. This month’s bouts are not to be missed. The only conflict this month is on the 23rd when both the Kansas City Roller Warriors and the Blacksnake Rollergirls take the track at their respective venues. As of press time, KC Derby Digest will be sending a photographer to Memorial Hall to cover the KCRW bout. Stay tuned here and on social media for updates and photo albums. Roll on, Kansas City!